• 7 days and 6 nights in luxury beach Hotel Guanahani & Spa www.leguanahani.com. •Daily yoga at Coconut Grove or Clarins Spa. • Daily meditation & detoxification guidance. • Daily delicious healthy meals. • Beach walks & core-strengthening exercises. •Welcome fruit platter or cocktail upon arrival. •Special Clarins gift bag with any spa treatment booked. •R0und trip airport pick-up and drop-off. *All rooms include full board, private bathrooms, ocean views, access to spa, tennis courts and other amenities. 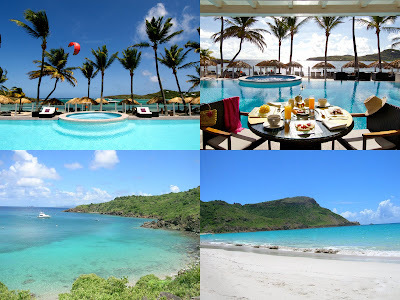 REJUVENATE with celebrity yoga guru RUAH BHAY to St. Barth's in the French West Indies this March. Seven relaxing days and six peaceful nights in ocean front luxury Hotel Guanahani & Spa. Yoga by the crystal clear blue waters and white sandy beach, meditation, healthy meals, abdominal strengthening, walks on the beach and in the mountains. Cultivate strength, flexibility & a peace of mind alongside the beautiful beach front location just a plane ride away. Ideal for solo travelers, friends or couples. Limited rooms available & subject to sufficient sign-ups. For more information contact: ruahyoga@gmail.com. Copyright 2009 ©Ruah Yoga. All rights reserved.